Happy New Year everyone! Here’s to a splendid, happy and healthy 2015 for all of you! Only a few more days of vacation for us, and then, on Monday, the children will be back in school and we will be back behind our computers — and behind tons of laundry to catch up with, fridges to clean and fill, birthdays to prepare, dentist appointments to make, etc. etc. 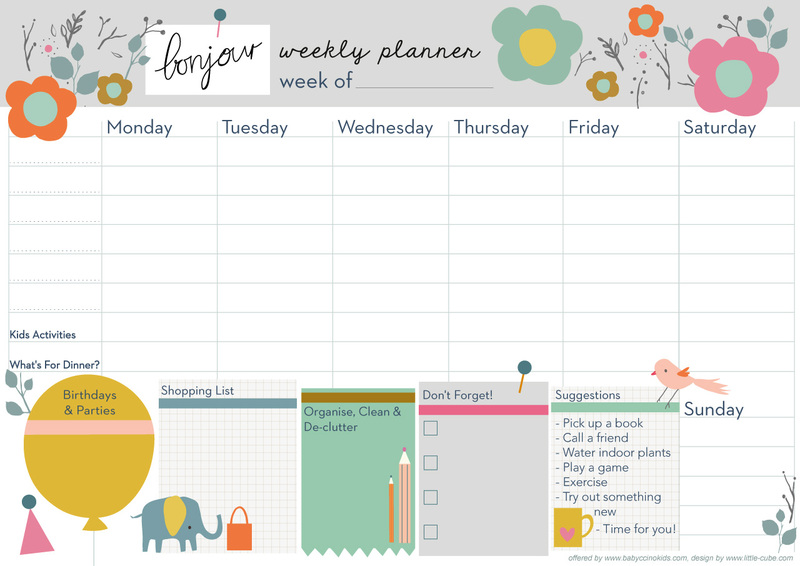 This year though, we’re going to be so organised, because together with the talented Sara Betz from Litte Cube, we designed a super cute weekly planner which will help you to organise everything! We’re so excited by this, and we can’t wait to start using it on Monday. You can just download the PDF here, and print to use. Happy New Year! Happy new year to you all. Thanks so much for this planner – I’ve just printed mine! So cute! Happy New Year and thanks for the beautiful planner! this is great, thank you! I just printed a couple, will hold me over until I get a new bound planner. Happy New Year! Happy New Year, Courtney & Esther. I would like to bring your attention to a website I found a couple of days ago – GOMI (Get Off My Internets). In the forums section under “Mommy/Daddy Bloggers”, there’s a whole thread of 40+ pages that says some awful things about mainly Courtney, but also Esther. The thread is titled #bringbackcourtneybabyccino – Instagram campaign. This is great! I like that it’s just a week at a time and I could throw it away after use and start fresh with a new one. Will print :). Love your planner, has kept my family beautifully organised all week, even my husband has taken a glance at it!